Our product is something we have grown up with. As one of the world’s largest private compost producers, we are known for our high quality. This is a given for the grower as well as for the end consumer. 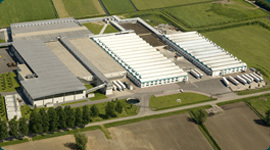 Hooymans compost can be used both for inoculable products and for full grown products. This means that for full grown products we already put the spawn (mycelium of the requested mushroom) into the compost, allow it to grow and add supplements to produce a product that can be used by the grower. The result is a compost with optimum mycelium growth of ± 17 days. In addition, our compost can also be used for inoculable products, where the spawn has not been inoculated. This leaves the compost suitable for specific fungi, and the grower can inoculate it with the desired type himself.